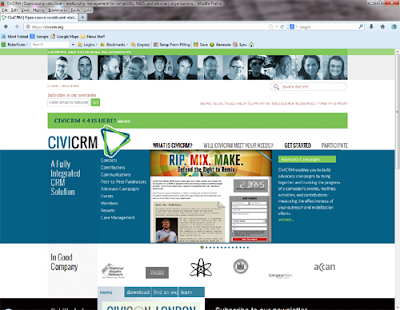 CiviCRM is almost certainly the NFP sector's leading open source CRM system. And if you want an example or two of why this is, then, aside from its standard functionality, the following should explain a lot: Just recently, Leukaemia and Lymphoma Research, who use CiviCRM, wanted to integrate Civi with JustGiving and so they developed an integration piece to do this - and they have made that available for free for all other users of CiviCRM. Prior to this, the recent HMRC Charities Online gift aid update meant that changes were needed to the existing CiviCRM Gift Aid functionality, and again, Leukaemia and Lymphoma Research developed the changes required and made them available to the Civi community. And even before that, when there was no Direct Debit processing or Gift Aid functionality available in CiviCRM, a third-party Civi partner, NFP Services, developed these features - although they did this as part of a paid-for development - but thereafter, those functions are now available to all other Civi users. And if a CiviCRM user wants a new function which hasn't yet been developed in the core software then, although they can of course enhance the system in-house as Leukaemia and Lymphoma Research did, or pay a developer to create that for them - and there are a number of CiviCRM approved service partners here in the UK as well as worldwide - they can also add it to the 'Make it Happen' campaigns on CiviCRM's website where ideas can be put forward and multiple Civi users can contribute in order to fund the development. This shows the appeal and benefit of CiviCRM to some charities: collaboration and joint development (as well as good software). And shows the all the great things about the Open Source community - and yet it also highlights some of the dangers too. The benefits are clear: open source is free software, although please remember that it is just the software which is free; the implementation, developments, training, data migration, any consultancy/project management etc, and of course the hosting or in-house servers, all cost money. And it has a great ethos for charities, and an ever-growing and broadening community using and supporting other users. And by its very nature it tends to attract developers who believe in not just the software but the whole approach. But the fact it is not driven by a commercial organisation means that when statutory or regulatory requirements change (as highlighted above), then a user and/or the community needs to get the software updated to manage that. And although the software is constantly being developed and enhanced, it doesn't have the same financial clout which some of the larger commercial CRM suppliers have and as it isn't a dedicated fundraising database then there is a different incentive to the 'traditional' fundraising database suppliers. Of course, this approach is the very thing which encourages some organisations to use CiviCRM (!) and as it states on Civi's website, "CiviCRM’s development roadmap is primarily generated from the ground up". CiviCRM has a lot going for it. It is one of those systems where it feels there should be a natural, cultural fit with the NFP sector. It has decent functionality and it is growing its user-base here in the UK. It isn't a "traditional" fundraising database system, but neither is it a "generic" CRM solution (a la Salesforce, MS Dynamics etc). What it is is a "CRM" solution which has been created specifically for the nonprofit sector, and as such, with in-built functionality specifically created for charities. And because it is not oriented at just one "type" of solution for charities (i.e. not just service delivery, not just case management, not just fundraising, volunteer management etc) it has a degree of flexibility similar to that which the CRM solutions also offer, if maybe not quite so in-depth. (It's unlikely, of course, that CiviCRM will ever be as big as the major CRM players because it is sector-focused). When I discuss different database options for charities, I often pigeon-hole software suppliers as "traditional fundraising database solutions" or "generic CRM solutions" - CiviCRM is neither but that is no bad thing, and if you are considering a new CRM system or fundraising database then putting CiviCRM on your radar could be well worth it.